J.S. BACH: Aria mit verschiedenen Verænderungen (Variations Goldberg), BWV 988. 14 canons sur les huit premières notes de basse de l’Aria des Variations Goldberg (manuscrit de Strasbourg), BWV 1087. Die Wasserrüben und der Kohl (Volkslied, sopra la Bergamasca). Ich bin so lang nicht bei dir gewest (Kebraus improvisé). Céline Frisch, harpsichord (Anthony Sidey). Dominique Visse, countertenor. Ensemble Instrumental Café Zimmermann. Alpha 014, 2 CDs (77:30, 24:50). At last we get rays of sunshine and breaths of fresh air in Mlle. Frisch’s new recording! We take leave of the museum and move into an elegant 18th-century salon where music is a refined entertainment. For starters, Frisch treats the beginning sarabande as a dance, not a dirge. The sarabande and chiacona were both downright lewd, hip-swinging, belly-rubbing dances brought back from the Americas by Spanish soldiers, much to the delight of the unwashed and the chagrin of ecclesiastics. The lewdness is toned down here, but it’s still frisky and possibly suggestive. And andante is taken literally as ‘moving along,’ ohne schleppend to quote Gustav Mahler. Wherever Bach employs dance rhythms, Frisch makes the notes spring, bounce and trip, keeping everything subservient to long, flowing melodic lines. The famous Variation 25 is not treated as Romantic mellerdrammer but rather as a meditative improvisation in the style of Froberger, as Bach probably intended. The final Quodlibet is not given the usual bang-smash, grande finale treatment. Frisch plays it as the evening’s stately and satisfied final dance. The harpsichord’s sound is resonant and nonmetallic. No banging jangles here. And the recording is just about ideal — far enough away from the keyboard and the action to reproduce the kind of sound you would hear in a drawing room. Needless to say, this performance is a rippling delight. And Frisch doesn’t hum a single note! 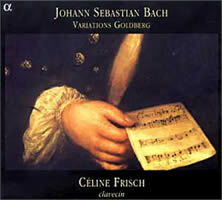 The second CD contains the 14 canons that Olivier Alain found in Strasbourg in Bach’s own printed copy of the Goldbergs. Besides adding his own emendations and corrections Bach filled up blank spaces in the rear with canons on the bass notes of the Goldberg sarabande — contrapuntal doodles, as it were, played with panache by the Ensemble Café Zimmermann. Countertenor Dominique Visse takes both the baritone and soprano parts singing the songs employed by Bach in the final Quodlibet. Interestingly, scholars turned up the lyrics in von Arnem and von Chamiso’s Des Knaben Wunderhorn, where Mahler also found the songs for his cycle. Finally, the Zimmermann Ensemble improvises a Kebraus of their own, complete with hurdy-gurdy! All this enthusiastic, joyous music-making comes elegantly packaged by Alpha, an adventurous new label from Paris. BUYER’S NOTE: I secured my copy via the Net in two weeks from a reliable and respected British dealer: http://www.mdt.co.uk/. You can also try http://www.alpha-prod.com/. BACH: Aria mit verschiedenen Veränderungen, BWV 988. Goldberg Variations. Ketil Haugsand, harpsichord. SIMAX 1192 (70:54). Available at ArkivMusic. Haugsand, a professor at the Hochschule für Musik in Köln, plays a reproduction by Martin Skowronek of an unsigned instrument from the Charlottenburg Palace, Berlin. Superbly recorded by Arne Akselberg, Haugsand offers a more sober-sided rendition than Mlle. Frisch, but with more rhetorical agogics and quite a bit more ornamentation. This recording nevertheless avoids the ‘smell of the lamp’ — quite musically satisfying if less bouncy than the Parisian offering. Both the instrument and its recording avoid the metallic banging that all too often accompanies harpsichord efforts. Thus we have two remarkably different but valid modern interpretations to put in the place of the Gouldbergs. 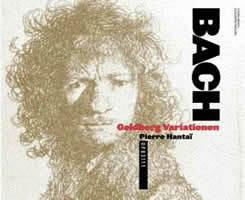 BACH: Variations Goldberg. Pierre Hantaï, harpsichord (Bruce Kennedy after Mietke, Berlin, 1702-04). Opus 111 (77:31). Even though recorded by Nicolas Bartholomée, who does most of Jordi Savall’s CDs, this performance now comes up as definitely flat beer as compared with the two preceding discs. M. Hantaï has a steady sense of rhythm and manages to play all the notes, but that’s about it. The interpretation never flies, much less soars. 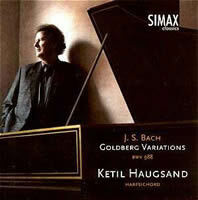 BACH: Goldberg Variations (1955 mono and 1981 analog stereo). Glenn Gould, piano. SONY AS3K 87703, 3 CDs (153:11). Available at ArkivMusic . 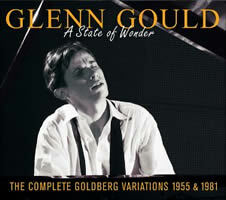 Like RCA with its Caruso recordings, CBS/Sony has its own cottage industry in recycling Glenn Gould recordings. I shan’t get into nit-picking every variation or the controversy over Gould’s interpretative style. I would like to add a bit of context that has not really been brought out because most reviewers are not octogenarians. It’s been little remarked that Glenn Gould started his career in Toronto as a boy-prodigy organist. And at that time, in the late 1940s, all the rage among organists was to play Bach non-legato, détaché, having arisen from some misguided attempt to be historically authentic and, I believe, as a reaction against the creamy Victorian legato style, which was essentially piano technique transposed to the pipe organ. For the long-defunct Musicraft label, Ernest White, organist at St. Mary the Virgin (Smoky Mary), made a perfectly dreadful rendition of Bach’s Eight Little Preludes & Fugues sectioned in this fashion. Either young Mr. Gould was taught to play this way on the organ, or he adopted it all by himself to show how trendy he was. In any case, he persisted in this style in all his piano playing, including Mozart! The other CD is a transfer of the 1981 analog back-up recording — not the digital master. Here Gould sings along even louder and more often than he did in 1955! The notes make much of the analog tape sounding more natural than the early digital. Probably so. But in the March, 2002 issue of Stereophile, page 45, John Marks mentions another problem with the digital takes: a “ghost” or “mouse” orchestra playing along at very low level (but plainly audible) in some variations. Far be it for me to libel CBS/Sony, but I did read about this elsewhere and neglected to note the citation. It was also mentioned that this music appeared on only one channel. The interpretation offered was that perhaps an adjoining editing suite leaked a signal onto the digital tape. It’s that kind of BS that prompted me to turn off on the whole problem. But I have another hint as to what may have happened. If you look at any pro console, you’ll see at one side or the other a rat’s nest of cables plugged into a patch bay that somewhat resembles the old-time telephone PBX switchboard. This allows engineers to link the console with machines and machines to each other, including outboard processing devices. But it’s an all-or-nothing situation. Either you’re patched in and get a 2.2-volt (+4 dBm) signal or you don’t. Regardless of what kind of electronic mayhem was happening next door, you won’t get any of it if you’re not patched through. And if you are, you won’t be getting any “ghost” music, but rather a full signal. Follow me into my neighborhood, if you will. Beginning in the 1950s, I’ve occasionally recorded films and mostly commercials in a rental sound stage at 27th Street and 3rd Avenue, Manhattan. Even today NYU still rents it for their film lighting class. Once I was setting up to record voiceovers in an upstairs dressing room that faces the eastern side of Third Avenue, and I started getting an easy-listening FM station in my headphones. Looking out the window, I had a line-of-sight view of the antenna atop the Empire State Building. Obviously my unbalanced headphone cable was acting as a beautiful antenna for RF (radio-frequency) interference. You’d better believe the conniptions I went through to make sure that dreck wasn’t getting on my tape! A colleague of mine once measured 1.5 volts of radio-frequency energy on 34th Street just under the Empire State Building. Now let’s get back to Mr. Gould’s digital recording — made at the CBS studio on East 30th Street — right under the flight path of the RF energy coming off the Empire State antenna! It’s entirely possible that a slightly defective interconnect cable could have detected FM and brought it in to the digital recording or its copy in editing. Oh, yes: Another stage, the prototypical Toilets of America used to be at 10th Avenue and 54th Street. The RF was so bad there you couldn’t record video at all, unless you happened to like squiggly diagonal lines across your picture. The source was a large, windowless building across the street capped with microwave antennas. That stage was demolished to be replaced by high-rise, luxury condos. I often wonder what the occupants get on their large-screen TVs or Home Theatre rigs. Welcome to New York, folks! Back to the Gouldbergs. You either like Gould’s pool-cue-in-the-eyeball keyboard technique or you don’t. Personally I feel it’s a low-down, dirty shame that the only Goldbergs most listeners have ever been exposed to are Gould’s.